Unsurprisingly, President Trump was spoofed by "Saturday Night Live's" summer "Weekend Update" premiere, but it turned out that Anthony Scaramucci -- the short-term White House communications director -- offered a more enticing target. "SNL" alumnus Bill Hader played Scaramucci, who referred to himself as "the Mooch" and insisted he had "no regrets, baby" about his brief tenure in the Trump administration. "All I did was sell my company, miss the birth of my child and ruin my entire reputation, all to be king of Idiot Mountain for 11 days," he said. The faux Scaramucci also addressed his tart comments about presidential adviser Steve Bannon -- saying he had actually seen Bannon perform the act that the real Scaramucci described to the New Yorker's Ryan Lizza. In his first sit-down TV interviews since leaving the White House, Scaramucci will appear on ABC's "This Week" on Sunday, followed by an appearance on "The Late Show With Stephen Colbert." Trump, naturally, didn't escape derision. Co-anchor Colin Jost cited the upheaval surrounding the White House, saying that while he was unsure whether Trump had colluded with Russia, "He's definitely colluding with 'Dancing With the Stars.'" Jost also poked the president for making his controversial "fire and fury" comment regarding North Korea while seated, quipping, "Even FDR stood up when he was talking tough." And Michael Che mocked Trump for folding his arms, saying he looked like "a Jeff Dunham puppet." 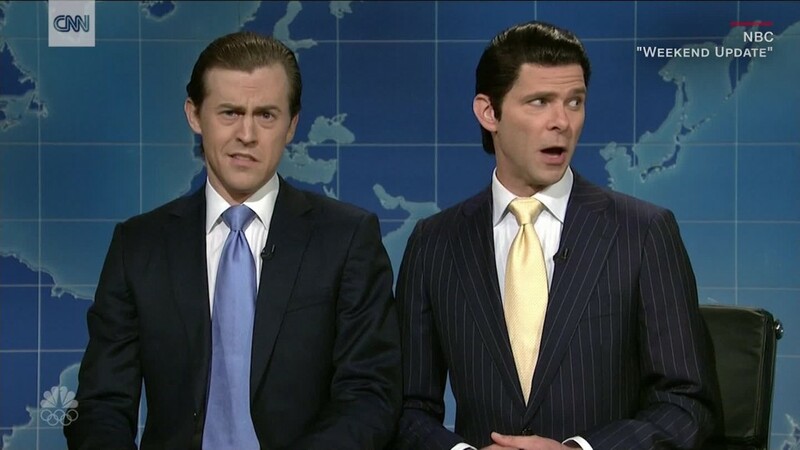 The half-hour show -- which will provide four weeks of original summer filler -- also featured "SNL's" Mikey Day and Alex Moffatt reprising their roles as the president's sons, Donald Jr. and Eric, respectively. Notably, less than half the episode was devoted to politics, with Kenan Thompson appearing as LaVar Ball -- the outspoken father of Lakers rookie guard Lonzo Ball -- and Leslie Jones chatting up her toned-up physique, asking Jost to kiss her bicep. "I just showed you what's going to happen to you when you go to jail, Colin," she said. Jost also referred to NBC's pre-premiere renewal of its "Will & Grace" revival, wryly suggesting that the network might be diluting another venerable franchise by overdoing it.